The feud in the Yadav family reared its head once again on 23 October when Uttar Pradesh Chief Minister Akhilesh Yadav sacked his uncle Shivpal from the state cabinet along with three other ministers. Samajwadi Party chief Mulayam Singh Yadav retaliated by suspending SP general secretary Ramgopal Yadav from the party for six years. Political pundits have predicted that the ruling party in UP may be heading towards a split. In the latest development, SP supremo Mulayam has summoned all senior leaders, MPs and MLAs, former MPs and MLAs for a meeting at the party headquarters on 24 October. 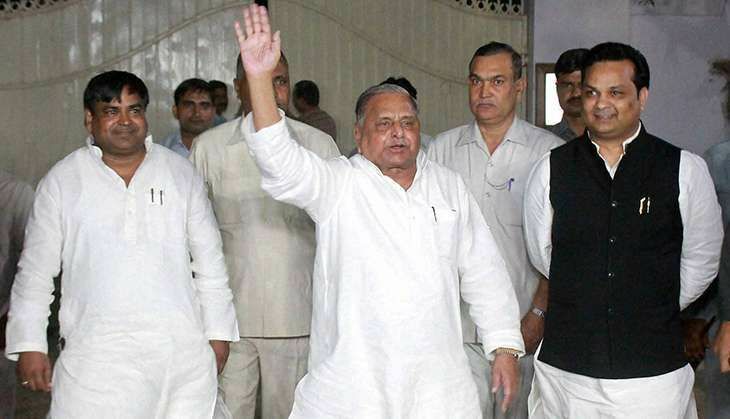 02:30 pm: Crucial meet at Mulayam Singh Yadav's residence ends. 01:38 pm: Meeting between Akhilesh and Mulayam continues at latter's residence. 12.27 pm: SP meet ends. 12:26 pm: Heated argument breaks out at the meeting. Mulayam accuses son, Akhilesh, of lying. "Aapka mukhyamantri jhooth bolta hai (Your CM is lying)"
11:55 am: "Look at PM Modi, he became PM with dedication & struggle. He comes from a poor family, says he can't leave his mother" Mulayam said. "I tell Akhilesh things but he focuses on other things; abusing people does not help," he added. 11: 50 am: I can't leave Amar Singh or Shivpal Yadav. All of Amar Singh's sins are forgiven. 11:45 am: I will never forget the work Shivpal has done for me and Samajwadi Party. Drunkards, goons have been added to the party. You get some power and it goes to your head. Shivpal Yadav is leader of the masses. 11:26 am: Mulayam Singh Yadav addresses party workers inside SP office. 10: 59 am: Shivpal Yadav addresses party workers inside SP office. 10:45 am: Akhilesh Yadav breaks down while giving a speech at SP office in Lucknow. He said, "If Netaji asked me for resignation I would have given it." 10:40 am: "People are saying a new party will be formed. Who is forming is a new party? I am not": Akhilesh Yadav. 10:35 am: Akhilesh Yadav addresses party workers. "Give me time to speak in front of Netaji and Shivpalji because many people trying to create confusion about me," he says. 10:20 am: Mulayam Singh, Akhilesh Yadav reach meeting venue. 10:15 am: Police use force to disperse protesters outside SP headquarters as clashes between supporters of CM Akhilesh and Shivpal Yadav escalate. 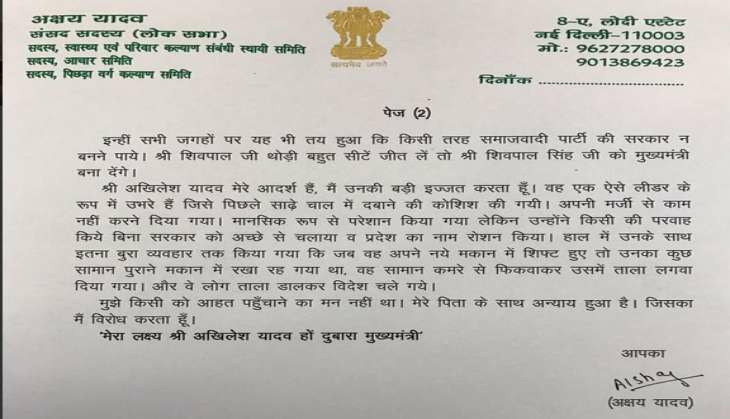 09:55 am: Ram Gopal Yadav's son Akshay Yadav has released an open letter. Akshay has expressed sorrow at his father's expulsion. "Akhilesh was treated so badly that he was forced to shift to a new. His belongings were thrown out of his room and it was locked while the CM shifted to a new house house. My aim is to see Akhilesh Yadav as the CM again," he alleges in the letter. 09:40 am: Supporters of Shivpal Yadav and Akhilesh Yadav clash outside the SP office. 09:25 am: After reaching the party office, Shivpal said, "We are preparing for upcoming elections and will directly meet people, I knew this will happen someday." 09:24 am: Shivpal Singh Yadav has reached the party office in Lucknow.